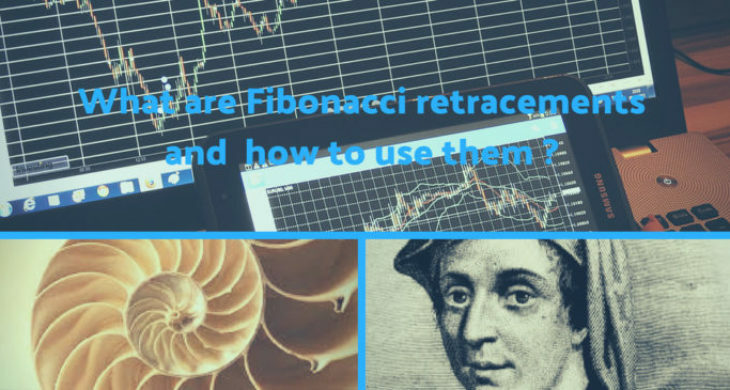 Learn Market Online > Education > Technical analysis > Fibonacci > What are Fibonacci retracements and how to use them ? What are Fibonacci retracements and how to use them ? The Fibonacci retracements are defined as ratios that are used to pinpoint potential reversal levels. These ratios under consideration, are found in the Fibonacci sequence. The well-known Fibonacci retracements are 61.8% and 38.2%. However, you should take note that the 38.2% ratio is most often rounded to 38% whilst the 61.8% is also often rounded to 61%. One of its uses is that it can be applied to define retracements levels and foresee the extent of a correction or pullback. It can also be applied after a decline to foresee the length of a counter-trend bounce. You can also aggregate the retracements with other indicators and price patterns to create an overall better strategy. What is the Fibonacci sequence? The content of this article is not meant to delve deeper into the mathematical properties that back the Fibonacci sequence and Golden ratio. You can check other sources for a more explanation of what Fibonacci is. However, knowing the basics from this article will serve as a stepping stone to better understand the Fibonacci retracements. Leonardo Pisano Bogollo Fibonacci, an Italian mathematician from Pisa, born in 1170 and died in 1250 is responsible for the introduction of the Fibonacci sequence to the west. They are as follows. There are several guiding principles which lay the foundation of Fibonacci sequence. The Fibonacci sequence extends to infinity and contains numerous mathematical properties that are unique. Each number in the sequence the sum of two number that preceded it (1+2=3, 2+3=5, 5+8=13 etc……). When you divide a number by the next number in the sequence, the resultant number is approximately 0.6180. An example is (13/21=0.6190, 21/34= 0.6176 etc……..). The resultant approximate number nears 0.6180 as the numbers increase. This is the fundamental basis behind the 61.8% retracements. The resultant number when you divide a number by another two places higher approximates to 0.3820. For instance (13/34=0.382, 21/55=0.3818, etc……). The resultant approximate number nears 0.3820 as the numbers increase. This is also the fundamental basis behind the 38.2% retracement. You should also take note that 1- 0.618 = 0.382. The resultant number when you divide a number by another three places higher approximates to 0.2360. For instance (13/55=0.2363, 21/89=0.2359 etc……….). The resultant approximate number nears 0.2360 as the numbers increase. This is also the fundamental basis for the 23.6% retracement. Golden Ratio or Golden Mean also called Phi refers to 1.618. You can find these ratios in the entirety of nature, architecture, art, and biology. You should bear in mind that, the retracement levels can serve as an alert for resistance or support area that are of potential as well as potential trend reversal. Retracements are fundamentally based upon the previous move. When a bounce occurs, we expect it to retrace a part of the previous decline, while we expect a corrective move to retrace at least 50% of the previous leg higher. Technical analysts are able to identify specific Fibonacci retracement levels to monitor once a pullback starts. Analysts should stay alert for a potential bullish reversal once the correction wave reaches particular retracement level. The chart picture below shows home depot tracing around 50% of its previous advance. Also note that 38.2% level has formed a strong level of support after the market has failed to break above 50% of Fibonacci Retracement level. The opposite is applied to a bounce or corrective wave higher after a decline. Chartist are able to identify specific Fibonacci retracement levels to monitor once a bounce starts. It’s important that chartist stay alert in case of a potential bearish reversal once a bounce begins. You should also bear in mind that these Fibonacci retracement levels are not hard reversal points. Rather they serve as alert zones for potential reversal. At this point, traders are advised to employ other technical analysis tools for additional confirmation. Fibonacci effectiveness can be greatly enhanced with such tools as momentum indicators, chart and candlestick patterns. There are four common retracements that are demonstrated by the Fibonacci retracement tool. Namely 23.6%, 38.2%,50%, and 61.8%. It is obvious from the section above that 23.6%,38.2% and 61.8% are ratios that originate from within the Fibonacci Sequence. The 50% originate from Dows Theory instead of the Fibonacci sequence, The Downs Theory states that the averages often retrace half their previous move. The 23.6% retracements can be deemed as shallow based on depth. Retracements like this can be deemed as appropriate for flags or short pullbacks. Retracements between the range of 38% -50% would also be deemed moderate. The 61% retracement which is deeper can be considered as the golden retracement because it’s after all based on the Golden ratio. There are possibilities for shallow retracements to occur but in order to catch them, you need to have a quicker trigger finger as well as keeping a closer watch. The examples illustrated below shows the use of daily charts covering a time period of 3-9 months. These illustrations will also demonstrate how to use retracements with other indicators to confirm a reversal. The chart picture below demonstrates the AUD/USD currency pair. As can be seen on the picture correction occurred one the downtrend started to demonstrate some weakness around 61.8% Fibonacci Retracement level of the previous move higher from 0.7500. Further confirming the reliability of the signal is the RSI indicator which seems to have dipped towards the lower end of the range, signaling oversold conditions and as such a strong possibility of trend reversal. Fibonacci trading an assist you to identify the end of a correction or a counter-trend bounce. It is typical for counter-trend bounces and corrections to retrace a part of their previous moves. Despite the obvious fact that the short 23.6% retracement occurs sometimes, the 38.2 – 62.8% has a higher possibility for occurrence (with 50% being in the middle). Although this zone may seem huge it is actually just a reversal alert zone. Other technical analysis signals are required for the confirmation of a reversal. These include momentum indicator, volume or chart pattern or relevant candlestick pattern. Always keep in mind that the more confirming factors you have the more robust the signal. Learnmarketonline is your meeting place; the crossroads where you can find everything you need to make the best decisions in the currency markets. Founded by the talented professionals with huge experience in financial trading. learnmarketonline strives to deliver the best education and training for everyone who is willing to improve his talents and open new horizons. Copyright © 2016 learnmarketonline.com All Rights Reserved.